A man walks past the logo of IBM at the world's biggest high-tech fair in the northern German city of Hanover in March 2010. European competition enforcers announced on Monday they were probing computer giant IBM on two separate cases relating to antitrust infringements. European competition enforcers announced on Monday they were probing computer giant IBM on two separate cases relating to antitrust infringements. "The European Commission has decided to initiate formal antitrust investigations against IBM Corporation in two separate cases of alleged infringements of EU antitrust rules related to the abuse of a dominant market position," it said in a statement. The charges relate to the firm's mainframe computer business, following complaints by rival software makers T3 and Turbo Hercules as well as commission concerns over IBM's relations with maintenance suppliers. 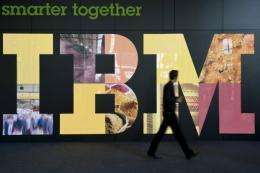 US-based IBM rejected the accusations and said the complaints were part of a Microsoft-driven campaign to "cement the dominance of Wintel servers" in the market at IBM's expense. "IBM will not allow the fruits of its innovation and investment to be pirated by its competition through baseless allegations," the company said in a release. "There is no merit to the claims being made by Microsoft and its satellite proxies." Mainframes, the huge computers used by governments and big companies, is a market worth some 8.5 billion euros (11 billion dollars) worldwide in 2009, and some three billion euros just in Europe. "IBM is alleged to have engaged in illegal tying of its mainframe hardware products to its dominant mainframe operating system," the EU said, with the complainants arguing the practice "shuts out providers of emulation technology which could enable the users to run critical applications on non-IBM hardware." Brussels also fears IBM is "keeping potential competitors out of the market... in particular by restricting or delaying access to spare parts for which IBM is the only source." IBM countered it is rightfully defending its intellectual property rights. "Certain IBM competitors which have been unable to win in the marketplace through investments in fundamental innovations now want regulators to create for them a market position that they have not earned," IBM said. "IBM is fully entitled to enforce its intellectual property rights and protect the investments we have made in our technologies." IBM vowed to cooperate fully with inquiries in the European Union.